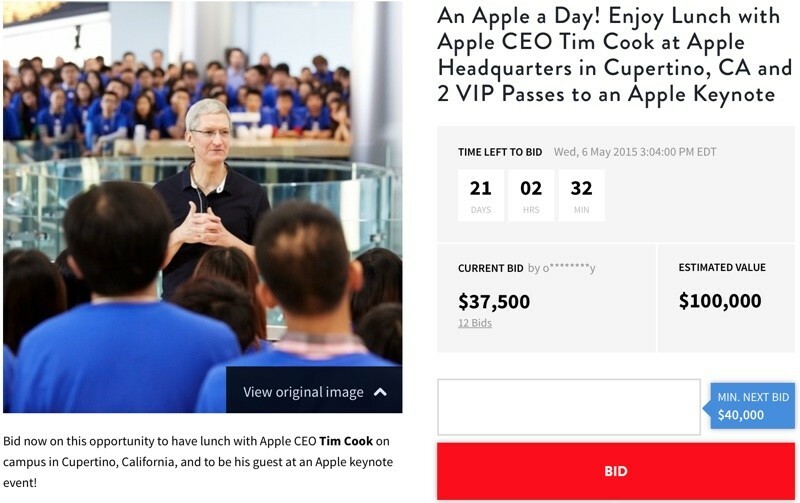 Tim Cook Auctions Apple HQ Lunch Meeting, VIP Passes to Apple Keynote for Charity. For the third year in a row, Apple CEO Tim Cook is participating in a charity auction through CharityBuzz, offering whoever bids the most the chance to enjoy lunch with him at Apple’s headquarters in Cupertino. This year’s auction also includes two VIP passes to an Apple keynote event to watch Apple unveil new products. Two people can have lunch with Cook, and the experience will last for approximately one hour. Lunch is included in the auction price, but the winning bidder will need to cover travel and accommodations. The exact date of the lunch will be scheduled at a mutually agreed upon time after the auction ends on May 6, 2015. The auction has an estimated value of $100,000, and bids are currently up to $37,500. This is the third year that Tim Cook has auctioned off an opportunity to spend time with him, offering a coffee meeting in 2013 that sold for $610,000 and a lunch meeting in 2014 that sold for $330,001. This entry was posted in Apple news and tagged Tim Cook. Bookmark the permalink.